Long gone are the days when Twitter was underestimated for its limited word count. People believed that it was a poor choice of social media channel for delivering the thoughts of one’s mind. Now, educators are utilizing this tool in their classrooms in the most creative ways possible. At the end of the class, ask your students to summarize whatever they perceived from the current lecture and tweet it at their profiles. This will allow you to evaluate the level of understanding within your students while improving their writing skills. Email filters and scans often make an important message end up in a trash folder. Through Twitter, you can easily direct your messages to the concerned person directly. If you are an Arts’ teacher, you can encourage your students to share their artwork on Twitter with a specified hashtag. This will persuade a development of support and self-confidence in the students. Post a new puzzle for students on Twitter everyday as a daily activity. It could be a math puzzle or a crossword puzzle. It will encourage intellectual development in students. Post a word game every day on Twitter for your students to solve, and then post the solution every day, at the start or end of the lecture, so you stimulate vocabulary skills in your students. As a creative writing teacher, post a one-liner start of a sentence for story as your Twitter status. Ask your students to continue the story through creative skills. During the class, help children to share facts or stories that they found interesting. Create a common hashtag so that the knowledge is common for all students. If you are a history teacher, make students work through an improvised scavenger hunt game. Drop off hints about the mysteries of the past and let students reach the end of the game, and get to the answer. Most common method almost all educators are using is Twitter. It can be used for announcing assignments and important dates related to the lecture, homework, quizzes and assignments. Use Twitter to post live feeds and vines of your classroom in order to post a positive image of it. It will also create a sense of motivation in your students as they will take a greater interest in class participation. Post a revision question daily. You can also allocate bonus marks for the answer so that students take interest in responding to your request. Try to involve your class in a general discussion, it could be course-related or a general discussion. It will help you connect with your students at a deeper level. Use Twitter to post sample questions and supplementary materials for your students. You can also post additional pointers of the lectures that you might have missed out in the class. 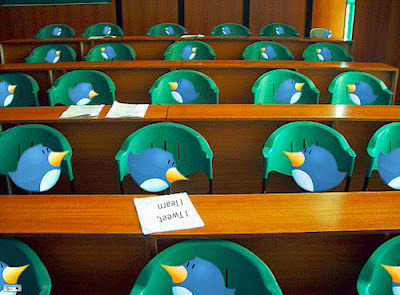 There are so many other ways for you to incorporate Twitter in your classroom. Use the social media channel to your advantage for providing maximum knowledge experience to your students. (*) Katherine Szlay is one of those expert dissertation proposal writers of dissertation mall who have contributed a lot to many online portals where students often ask how do dissertation proposal and get it approved instantly. She also keen interest in tech and education blogs.